There is an underground beer pipeline. It is over 3 kilometres long, and I've seen it. Naturally, when I found out about this fact, I had a lot of questions to ask, in a very excitable tone. I popped over to Belgium with my pal Tom Scott, in a quest to find answers for you, dear reader, and also to try to get some beer out of it. All we knew going into this was that the pipe connects De Halve Maan brewery in Bruges to its bottling plant, which is just outside the old city. Luckily, the brewery agreed to show us around and answer all the sensible and ridiculous questions we had. 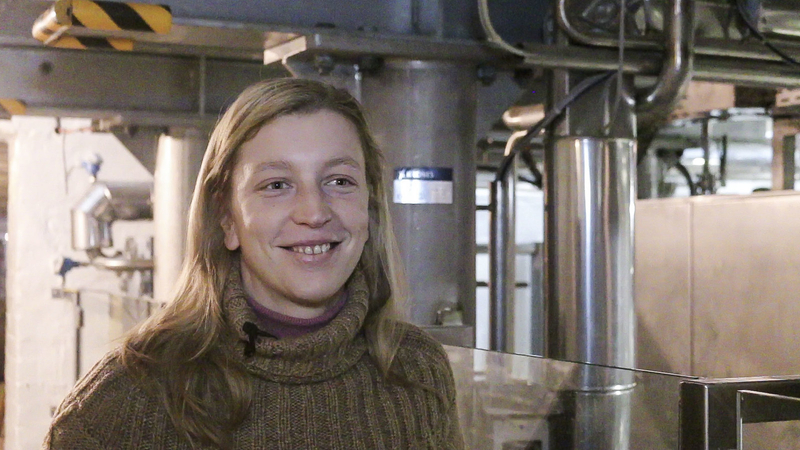 Anne Vanneste, assistant manager, and Bernard Degroote, bottling plant production manager, gave us the yeasty details. So, why is there a pipeline in the first place? A little context is required: The pipeline connects the brewery and the bottling plant, which would typically operate on the same site. As such, most factories will contain a small pipeline connecting these two stages; it's just usually much shorter. The main reason this dramatically longer beer pipeline exists is down to heritage. Bruges is a tiny UNESCO World Heritage site of a city; the central area, surrounded by a canal, is rather strained for space. De Halve Maan has been brewing there since 1856, and it's now the oldest brewery operating within Bruges. The brewers wanted to increase production levels, and as they can't build out, and they've already built up as much as they can, they had to build the new bottling plant elsewhere. They really wanted to keep doing the actual brewing in Bruges. It's kind of their whole deal. And so, the pipeline was built! How did it work before the pipeline came in? Previously, the beer was transported in trucks. However, the more they made, the more trucks ended up rolling – which the streets of Bruges are not particularly suited to. It would have required an unreasonable number of vehicles to support the brewery's projected production capability. Trucks still supply the brewery with the raw ingredients required for brewing, but the pipeline has drastically reduced the road traffic De Halve Maan was expected to generate. How does the beer get into the pipe? Once the brewery has performed the first fermentation in Bruges, they'll pop it down the pipe to transport it to the bottling plant. Interestingly, there's always something in the pipe – be it cleaning solution, beer, or water; it's never empty. Can we see the pipe? Could you drink straight from the pipe? You probably wouldn't like the taste! The beer transported in the line has undergone only its first fermentation and is unfinished. It's yeasty, and while you could probably get a bit drunk off it, you wouldn't enjoy it. People joke about tapping into it illegally. Are the brewers concerned about that actually happening? The fact the pipe is buried as deep as 30 metres (98 feet) in places stops this being too much of a concern. But before you go getting any smart ideas, even though they don't have guard dogs patrolling the length of the pipe, they do monitor inbound and outbound pressure within it, and they'd notice a discrepancy! So how do I get this routed to my house? A lot of people asked the brewers this when the pipe was being proposed and constructed, which inspired a selling point for the small amount of crowdfunding De Halve Maan did to pay for the project. One of the rewards was beer for life – which they hoped backers would find to be almost as good as a tap on the line. Of course, even if the beer was finished, commercial constraints and line-cleaning issues would make this wildly impractical. If the pub were to perform the second fermentation itself, then hey, possibly! But there are no plans to do this at this time. It'd be a lot of work and require a lot of expensive equipment, compared with just, say, buying the beer from the bottling plant as pubs currently do. How physically large is the beer pipeline? Could I swim in it? Hopefully that should clear things up for you. We're not sure if Transport for London is aware of this mockery – especially in light of the alcohol ban on the underground. The beer-carrying pipe material is HDPE (high-density polyethylene), which is a resilient, food-safe plastic. HDPE is regularly used in brewing anyway, so while the beer might spend a little longer in the pipes, it doesn't affect the taste. The outer shell of the pipe is plastic, and there are support pipes in the conduit to move things like cleaning solution, data cabling, etc. How much beer can it move per second? The pipe moves a tremendous amount of beer, in my opinion. It manages an operating flow rate of 6,000 litres an hour, which is just under three standard UK pints a SECOND. If you’re interested in the fluid dynamics of it all, there’s an interesting blog post about that, involving numbers that make my head hurt. Thank goodness for hydraulic engineers. Once the beer has travelled through the pipe, where does it go? ...and stored for shipping to customers! So you can be absolutely assured that on that day, it was all going perfectly, of course. Is it always the same kind of beer or do they flush it out, then send other beer? They do one beer per day, then clean the lines at night. It could be the same beer a few days in a row; it could be a different beer every day! De Halve Maan does quite a variety, too – single, double, and quadruple beers, which run all the way to 11% ABV. Let me tell you, 11% beer is quite an experience. How often are the pipes cleaned, and is it a similar process to line cleaning in a pub? The pipes are cleaned nightly, with either water or cleaning solution. We got mixed answers from the brewery here: Bernard said it was completely unlike pub line-cleaning and Anne said it was comparable. I think they wanted to emphasise that it’s thorough, so didn’t want to draw parallels to shoddy practice you might get in some pubs. Either way, this thing is kept spick and span. How does it handle carbonation? Beer is frothy! And that’s a problem – you don’t want air in your pipes. Their solution to this is quite clever, and used elsewhere in the factory too: They apply back-pressure, using carbon dioxide. So if you imagine the brewery is shoving beer down the pipe to the bottling plant, the bottling plant is pushing back against that flow, just slightly less, to provide resistance. This stops things getting too bubbly. It’s not running at an incredibly high pressure, though. Nobody had a PSI figure to hand, although they did mention that they pressurised the pipeline while constructing it to check for leaks – clever! How did people react to it being installed? Most were delighted! It didn’t affect their day-to-day lives too much, as it was installed using drilling techniques that don’t require excavation. This meant that the streets remained open, and with the goal of reducing traffic, that made for happy residents. How has it changed the beer-making/selling process? It hasn’t changed the process specifically, just the transport. 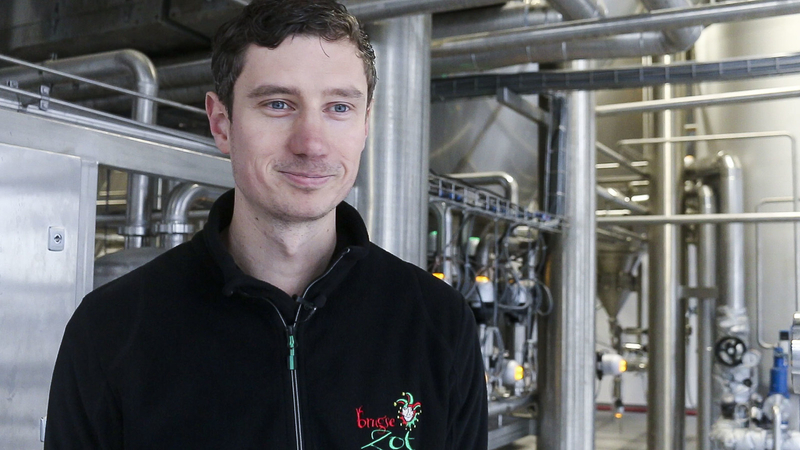 The beer is made the same way, and matured in the same way as before – but now they can brew more. Would they recommend other breweries try this? If space constraints meant that you would have to expand out of town to continue your business growth, yes, they would recommend it. But in reality, most breweries just move. De Halve Maan’s is quite a unique situation; the heritage of the site, the constrained space of the town, and the poor road links all made a pipe a logical choice in this instance, but maybe not for other breweries. Could they make a bigger pipeline? No, its flow rate is its flow rate. They could bury additional pipes, but the current pipe has a design capacity. The only way to move more beer would be to extend the operating hours of the beer cycle – move beer more often – as they’re not always operating when they could be at the moment. Could you have a beer network across the country like the water system? A surprising answer: Sure, why not! While the brewers don’t see themselves becoming a new utility service, and they did raise some interesting questions about how to keep the lines clean, they did find the idea intriguing. Would this work with other boozes? Could you have a gin pipeline? Yes! Absolutely you could. The pipe technology is relatively liquid-neutral, so could be used for a number of fluids with similar properties to beer. If it ruptures, could it create a fountain of beer like New York fire hydrants do in films from the ’70s? YES. YES, IT ACTUALLY COULD. They both confirmed this and WHAT A DAY IT WOULD BE. I asked Anne and Bernard for a fun fact. They both had the same answer: Nothing really went wrong with construction and it was all built to specification and on time. This remains the funnest fact I have been told by anyone so far in my life. I hope this article has answered all the questions you may have had when you learned about this 3.2km pipeline. Feel free to ask more in the comments.